HIPAA compliant single open end letter size oak chart and file holder (rack) with square mounting plate. Wooden Mallet's open ended chart holders provide easy access to charts while providing necessary privacy. These HIPAA compliant racks have a taller 9" front panel to keep names and records private. Chart holder pockets are 13 1/2" wide and will hold files up to 2" thick. 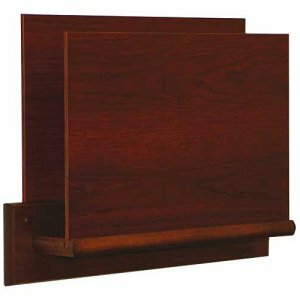 All chart holders are constructed with 3/4" solid oak bottom and mounting plate. All wall racks are predrilled and include hardware for easy wall mounting.